The team behind the Urban Kanga portable car seat have been actively involved in the baby industry for over 17 years. Our engineers and product development team have all previously worked for leading car seat and baby product companies. 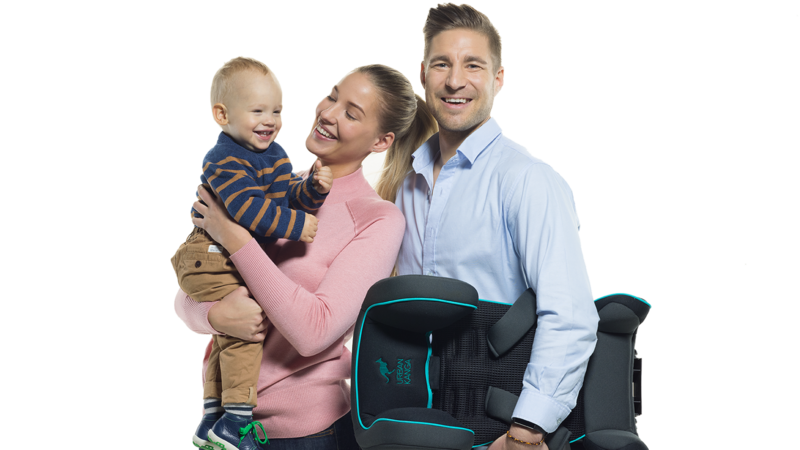 The Urban Kanga portable car seat is produced and tested in the same production and testing facilities as most of the more well-known brands. This means that you can be confident that you are buying not only safety but quality as well. We understand that safety is the number one concern when looking for a car seat for the most precious people in your life. As parents ourselves, we share this concern with you and are vigilant in safeguarding these standards. All Urban Kanga products are tested and certified to meet current European safety regulations under regulation R44/04. For more information on safety, please refer to our “safety” section. We also understand that you have many options to choose from, each with their own array of features and promises. Not every car seat is suited to every family. We recommend that you assess your needs and travel habits and select a seat that is both suitable for your child and to your lifestyle. Research has found that a startling 15% of parents do not put their toddler in a car seat for all car rides taken during a recent trip. The majority of instances where a car seat was not used involved taxi, car-share or ride share service. This can be largely due to the lack of a real solution that could cater to these mobile parents. We want to change this statistic by offering a safe solution while giving back to parents the freedom that they so often feel they have lost when traveling with children. This is the motivation behind our slogan – “inspired by freedom”. Urban Kanga is a registered trademark of BW Baby Warehouse GmbH & Co KG, a company based in Berlin, Germany, dedicated to sourcing and developing unique products for babies and toddlers.